Key words: Reinforced Concrete, Nonlinear Analysis, Finite Element Analysis. concrete model of the general purpose finite element code Ansys are presented and discussed. variations are made in a material model that is always basically the same are emphasyzed. satisfactory results may be obtained from relatively simple and limited models. of much more complex systems in a much more realistic way. design tool, an investigation of the capabilities of such codes seems to be of much concern. same structure has been performed, exploring different aspects of material modelling. considered in the reinforcing bars too. closed ones, are used to consider the retention of shear stiffness in cracked concrete. been analyzed (figure 1). Only the longitudinal reinforcement has been considered. Figure 1 - The beam analyzed. Due to transversal and longitudinal symmetry, a quarter of the beam has been discretized. solid elements, some of which containing a smeared reinforcement. Figure 2 - Finite element meshes: a) with discrete reinforcement; b) with smeared reinforcement. application of Ansys in reinforced concrete analysis. treated as elastic perfectly plastic. The analyses performed are summarized in Table 1. Table 1 - Summary of models analyzed. occurs earlier, yielding or crushing, prevents the occurrence of the other. linear elastic phase should govern tensile failure in all analyses. Associated flow rules have been used in all elastoplastic analyses. transition in this phase of stiffness degradation. occurred as soon as the failure surface has been reached by compressed concrete. Figure 3 - Load-deflection curves for models with discrete reinforcement. yielding of reinforcement, considering the amount of steel in the cross section of the beam. higher stresses than it would in reality as the nonlinear phase of stress-strain relation started. So, the failure of this model has been determined by crushing of compressed concrete. reinforcing steel, as it should due to reinforcement ratio. multilinear stress-strain relation in concrete compression. Figure 4 - Load-deflection curves for models with smeared reinforcement. incompatibility between yielding and failure in Ansys concrete model. best results obtained leads to a very good agreement (figure 5). may be considered the ultimate loads of the models and of the beam. 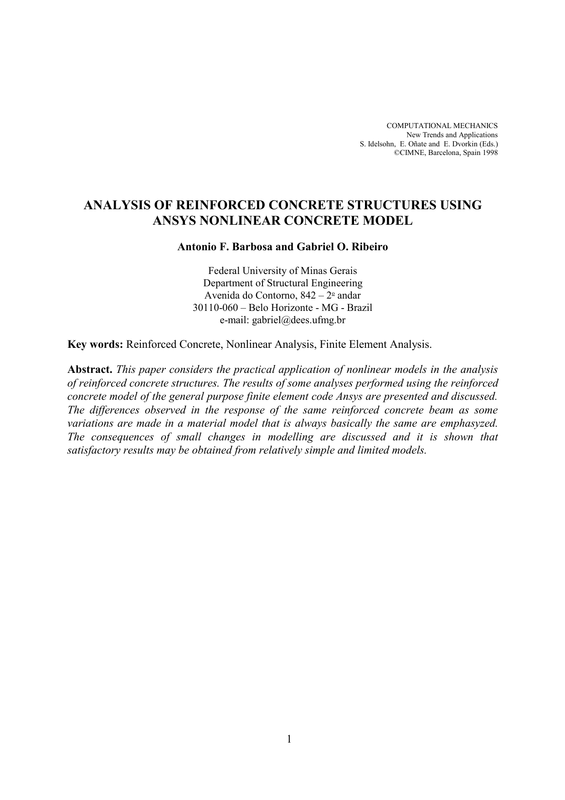 analysis of reinforced concrete structures using Ansys concrete model. ultimate load and determine the entire load-deflection diagram. concrete structures may be obtained. Modeling, Elsevier Science B.V., 1994. Finite Element Analysis of Reinforced Concrete Structures II, ASCE, p. 36-117, 1993. W. F. Chen and D. J. Han, Plasticity for Structural Engineers, Springer-Verlag, 1988. Element Analysis of Reinforced Concrete Structures II, ASCE, p. 203-232, 1993. (for Ansys Revision 4.4), Swanson Analysis Systems, 1989.